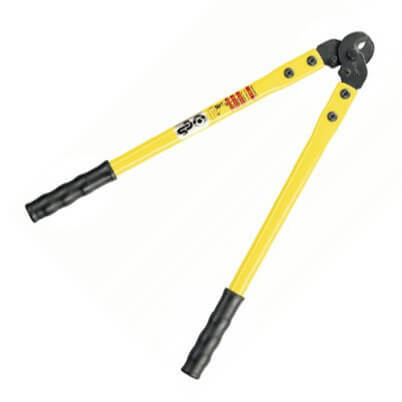 Hand Held Ratchet Wire Rope Cutters for up to 8mm Wire Rope. Wire Rope Cutter cutter for flexible wire rope to 12mmØ. For hard drawn wire ropes to 8mmØ. Face ground blades of rust resistant, heat-treated chrome vanadium steel. Baudat have specialised in cutting tools for copper and aluminium cables, wire ropes and a range of custom applications for over 30 years. Each cutter is individually tested due to the safety critical measures these cutters are designed for. This ensures that each and every cutter will do the job required in a variety of conditions. You may notice a slight gap between jaw blades. This is a normal feature that can aid against water retention which could eventually damage or compromise the cutter. Exactly what we wanted, product was easy to order, and the delivery was quick,we have yet to use this product but looks exact for job required.